USB 3.0 and USB 2.0 Compatibility Western Digital’s My Passport Essential SE features universal compatibility with widely-used USB 2.0 and next-generation SuperSpeed USB 3.0. When connected to a SuperSpeed USB 3.0 port, the drive lets you access and save files up to 3 times faster than USB 2.0. WD SmartWare Software The Western Digital My Passport Essential SE offers the WD SmartWare software that provides automatic, continuous backup and data retrieve through a visual control center. In addition, the software lets you customize your backup, set drive security, run diagnostics, manage the power settings and more. And if you prefer, you can choose not to use the software at all. Password Protection The Western Digital My Passport Essential SE provides password protection and encryption for securing your data from unauthorized access or theft. 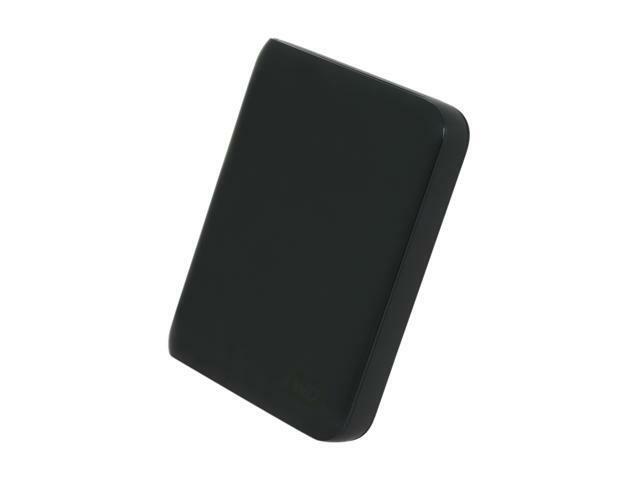 USB Powered Lightweight, stylish and easy to carry, the Western Digital My Passport Essential SE with massive capacity is powered directly from the USB port on your PC. No separate power supply is needed. 4.3" x 3.3" x 0.7"
Cons: Can no longer be found/read after 5 years. Only used for backing up my system drive weekly. Pros: Had it for over 2 years now, no real problems, fast, usb 3.0. Cons: Windows sometimes fails to recognize on boot up and must re-plug it in to initialize. Not sure if this is a software or hardware issue. Other Thoughts: My experience with this product is good - but read more reviews before you purchase. Pros: It is what it is. An external HDD. Decent performance *when it worked. * Today (Q1 of 2014) there are much better options with more space and lower price. Cons: I only used this periodically to back up my internal HDD (for desktop/tower and work laptop). I'd say total of less than 10 times over two years. Despite the infrequent use and very safe keeping, it started giving me strange clicks and random disconnects after about 15 months (keep in mind, I did not over use this or put any mechanical/hardware stress on it like some people do with constant back-up). Tried every other trick/solution I know and could find on the web. No dice. Nothing worked. New cable, different ports on different computers, nothing. And despite latest drivers and updated firmware, could not reformat the drive, check for bad sectors, nothing. The random disconnects were just too frequent. Last night, it totally failed with loss of all data, which I could not recover. This was about a year past the 2year plan, so I can't get a replacement. Ended up trashing it. Thankfully, I had the presence of mind to get another, better 2TB alternative from a different manufacturer in advance. So, my data is safe. Other Thoughts: The internet is FULL of complaints about this model (across different size versions from 500GB+) from WD. 1) the random disconnect issue, 2) the inability to make it a bootable drive, 3) the inability to make it into an internal drive. YMMV, but I'd recommend another brand/model with better performance and reliability. Pros: Worked as advertised. It had a fairly good speed to it. It died on the spot. Pros: Setup was easy. Does what I need it to do for extra storage. Cons: The USB 3 doesn't seem fast at all. Not anywhere close to the speed of my external eSata drive. Comments: luckily got the extended warranty. Will be returning soon - it mounted on the fourth try and I'm dumping all of my files off it. Fantastic drive while it lasted.